Spanish artists Patricia Gómez Villaescusa and María Jesús González Fernández, who created the multimedia exhibition Doing Time | Depth of Surface for Philadelphia print and contemporary art organization Philagrafika, will visit the Maryland Institute College of Art (MICA). The artists will discuss their process and experiences working in Philadelphia’s historic Holmesburg Prison for their latest exhibition. Exploring the prison’s archaeology and personal stories, Gómez and González have created large-format “printings” of drawings, paintings and graffiti left by former inmates on the walls of the prison, which opened in 1896 and operated for nearly a century before being decommissioned in 1995. The exhibition gives a voice to the guards, employees and inmates who lived and worked in the Northeast Philadelphia prison. The artist talk is free and open to the public. Doing Time | Depth of Surface will run from January 28 – March 17, 2012 at Philadelphia’s Galleries at Moore College of Art & Design, located just 100 miles northeast of Baltimore at 20th Street & The Ben Franklin Parkway. The exhibition explores new trends in contemporary art and printmaking, pushing the boundaries of what constitutes “print.” Philagrafika will also host related public programs, document and expand the project through its website and publish an exhibition catalogue. The first phase of the project began with an extensive residency, during which the artists conducted research and onsite documentation of the project. 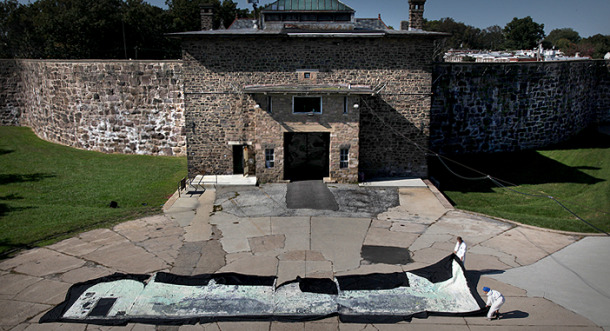 The artists visited Holmesburg Prison, where they utilized a unique method of monoprinting to transfer the history of the deteriorating prison’s walls into prints, salvaging the outer surfaces of the prison cells. The exhibition at Moore will feature a surveillance-style video installation along with an audio installation, still photographs from the residency and the resulting monoprints—two full-cell size and 150 smaller pieces—which serve as a physical archive of the prison cells and the lives of the prisoners who lived in them. Gómez and González work in a collaborative process grounded in an artistic practice similar to mural conservation. Utilizing a modified version of a conservation technique known as strappo, they work primarily to preserve the surfaces of building—the veritable “skin of architecture”—by detaching a wall’s surface layers. Using a layer of fabric and glue they remove the surface, in its entirety, in a process much like ripping a bandage off of skin. In fact Strappo, an Italian word, means to rip or tear. This process allows the artists to extract a tangible record of the site in its current state, preserving the expressions of identity, memory, apathy and desire of its former residents. Video of the process can be found on Vimeo at http://vimeo.com/31812447. Doing Time | Depth of Surface is Gómez and González's first exhibition in the U.S. The exhibition will be the fourth collaboration of this nature for the artists. Previous works include two installations of abandoned prisons, from 2008-2009, including Valencia’s Modelo Prison, and a prison in Palma shown in 2011 at the Fundació Pilar i Joan Miró in Mallorca, Spain. ADMISSION: free for all exhibitions and public programs. Philagrafika docents will lead a 30-minute tour of the exhibition Doing Time | Depth of Surface, highlighting stories from the artists' residency at Holmesburg Prison, while providing anecdotes and background on the creation of the artworks. Additional panel discussions and other public programs will be announced. Visit www.philagrafika.org for updates. To contact Philagrafika, call 215. 557.8433. The Doing Time / Depth of Surface artist residency and exhibition at Moore College of Art & Design is a project of Philagrafika. Doing Time / Depth of Surface has been supported by The Pew Center for Arts & Heritage through the Philadelphia Exhibitions Initiative and in collaboration with SPANISH CULTURAL ACTION, AC/E. Exhibition support was provided by the National Endowment for the Arts. Additional project support was provided by the Haverford Hurford Humanities Center Internship Program and Crane Arts.